Feel like a star! 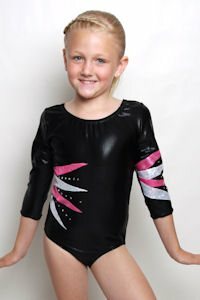 Shimmering black lycra leotard with a starburst of hot pink covered in silver swirls and silver hologram. Get this gymnastic wear in a tank or with 3/4 or long sleeves with a starburst on them! Add rhinestones for extra.